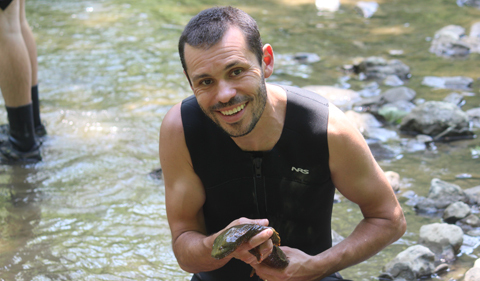 Dr. Viorel Popescu holds a hellbender. Popescu is Assistant Professor of Biological Sciences at Ohio University. Students Matthew Kaunert and Ryan Wagner also were quoted. 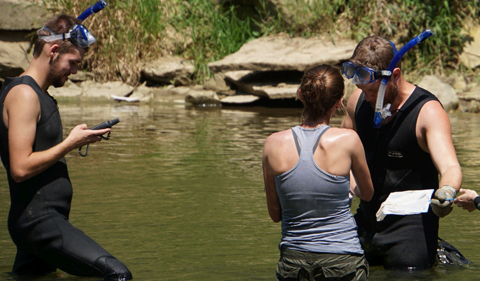 Students are hip-deep in the search for hellbenders. From left, Ryan Wagner, Christine Hanson and Matt Kaunert. The target of their search – the eastern hellbender – is a slimy, aquatic species of giant salamander that has made its home in Appalachia for 65-million-plus years. They’re a North American species that, despite their name and size (up to two feet or longer), are not in the least bit scary. In fact, they’re more threatened than threatening. While they’re listed as “near-threatened” in the U.S., their population in Ohio is in a much more vulnerable position, with severe declines in recent years (they’re listed as “endangered” in Ohio). That’s why Viorel Popescu, assistant professor of biological sciences at OU, was chosen by the Ohio Department of Natural Resources to work on a three-year effort to determine the population’s size, with the goal of helping the ODNR bolster that population. Consequently, Popescu’s students spent last summer tagging the hellbender population in Pennsylvania, which is far healthier than in Ohio, in order to get a good idea of how that population compares to Ohio’s. More recently, they’ve been traipsing around Ohio streams with metal-detector-like machines, to monitor the health of eastern hellbender populations that the ODNR has reintroduced in Ohio.